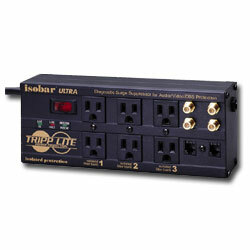 Loaded with a generous combination of high quality components, near indestructible all-metal case and unique noise filtration system, the Isobar offers the highest level of coaxial protection attainable in a multi-outlet strip. Robust surge suppression circuits with sine-wave tracking offer extreme levels of protection against the heaviest surge conditions exceeding IEEE 587 category A & B specifications and reducing 6,000V test surges to harmless levels under 35 volts. Surge suppression rated at 2850 joules / 92,000 amps offers network-grade protection. Widely spaced 15-amp outlets accommodate up to 4 large transformer plugs without blocking outlets. Two built in pairs of type F coax jacks cover two coax signal lines for satellite dishes, cable TV, broadcast antenna or cable modem applications. Built-in single line phone suppression protects pay-per-view connections and dialup modems.